This afternoon while cleaning out old photo folders on my computer I came across this picture. I remember seeing it last year and wrongly assumed it was in England. I put it on my list of places to visit when I arrive in the U.K. and was bummed to find out it is actually in Paris. 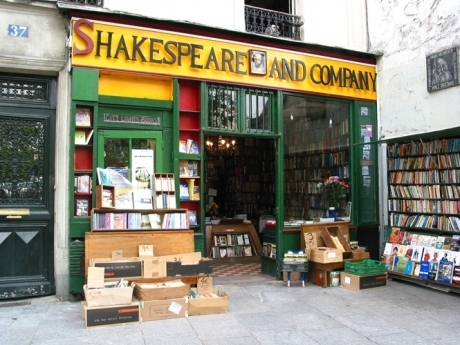 Supposedly this is the most famous bookshop in the world. This is because of the high number of visitors it receives annually due to its name and its original owner Sylvia Beach having published Joyce’s Ulysses. As I sat and contemplated the quaint colorful bookstore I wondered what kind of books I would find in it and oddly-though not real odd to book lovers-what it would smell like? Would it smell like an old musty building or would the smells from the nearest French bakery have visitors wanting to eat the books? Up until 2012, The Klencke Atlas was acknowledged as the world’s largest book, measuring 1,75 meters long and 1,90 meters wide. It takes six people to lift it and two to open it. Johan Maurits made The Klencke Atlas, which Amsterdam merchant Johannes Klencke presented to Charles II of England upon the king’s restoration to the throne in 1660.The book consists of 37 printed maps encapsulating the geographic and historical knowledge of the time. It is housed at the British museum. 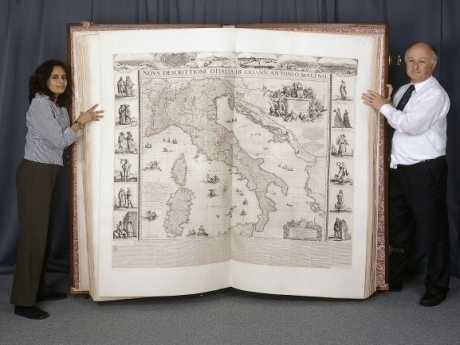 In 2012 the book’s classification changed so now it’s the world’s largest atlas. 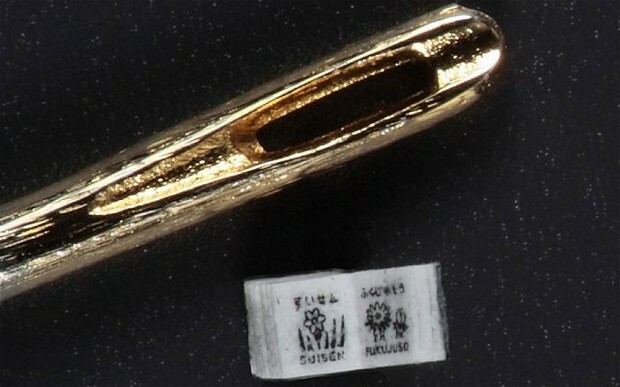 According the 2013 edition of The Guinness World Records website, the smallest book on records is entitled Flowers of the Four Seasons. The book measures 0.74 x 0.75mm. 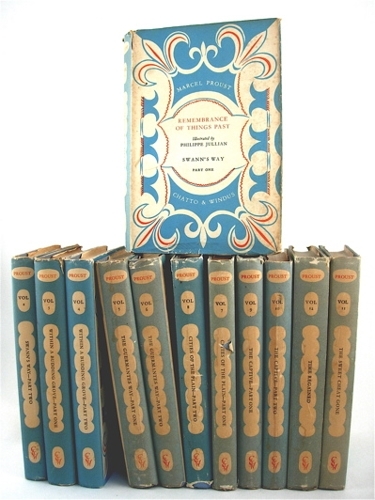 The book is sold as a set that includes an enlarged version and a magnifying glass. Not many who saw it at the Tokyo Printing Museum in 2012 were impressed. Only 149 copies sold. Now this was interesting research. I wanted to find the longest single volume book on record but found no real consensus on a particular title. Some arguments held the position that it is world length that counts, while for others it came down to character spacing. Some argue L. Ron Hubbard’s Mission Earth series was originally intended to be one novel, and by word count (1.2 million) would make it the longest book. But because crazy Mr. Hubbard never said it was one book the title remains with Proust and his 13-volume masterpiece A la recherche du temps, translated as Remembrance of Things Past. The book contains 9,606,000 characters. Who Houses the Most Books? The Library of Congress is the largest library in the world, with more than 155.3 million items on approximately 838 miles of bookshelves. 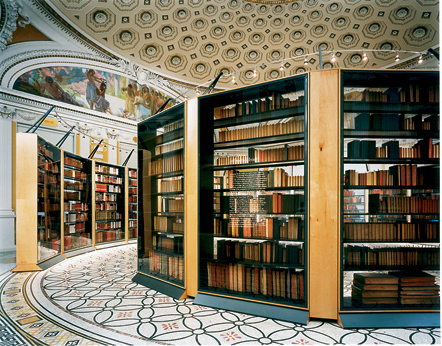 The collections include more than 35 million books and other print materials. Now I know where I want to spend my next vacation! I hope the chairs are overstuffed in well lit corners. He Bought it for How Much? 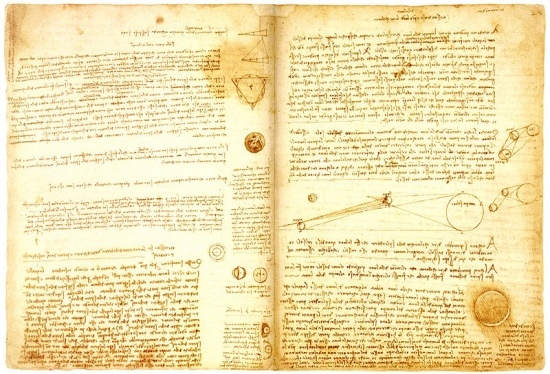 The Codex Leicester by Leonardo da Vinci was bought by Bill Gates for 30.8 million in 1994. The book is actually a 72-page document icontaining collections of scientific writings. The journal covers theories on astronomy, water, rock, air, the moon and the heavens. 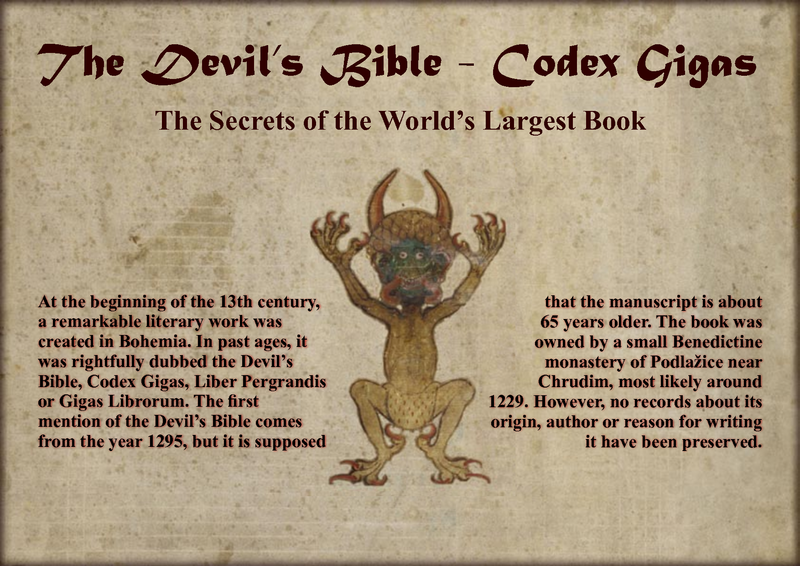 The Codex Gigas (giant book) or Devil’s Bible now housed at the National Library in Stockholm is famous for two features. First, it is reputed to be the biggest surviving European manuscript. Secondly, it contains a large, full page portrait of the Devil. Legend says that in 1295 in what is now the Czech Republic an arrogant scribe or monk (take your pick) was to be punished for his sins. He begged to be allowed to create in one single night a book that would glorify the monastery forever. Knowing he could not accomplish the task he sold his soul to the devil. By morning this large volume included the Bible, Jewish history, universal and medical knowledge and local history. The front cover and middle section both contain the same drawing of the Devil. What became of the scribe is never mentioned. The timing of the legend is unclear but we do know it was told in the middle ages. Oddly, National Geographic did some testing on the book and found that there was only one type of ink used, made from crushed insect nests. The style and font of the calligraphy is consistent throughout, leading the investigators to believe that the manuscript is the work of one scribe rather than many. Did you find an answer for the largest single volume book? I wondered if War & Peace might be a contender. Also, it may shock and sadden you to know that after Bill Gates bought the Codex Leicester, he dismantled it. He separated all the pages to display them individually, and I read that he sold some of the single pages privately. They’re probably well preserved, as who else could better afford to mount and frame them properly? But still, my puritan sensibilities are deeply offended by what amounts to further destruction of the precious writings of the Maestro. Just when I was starting to warm up to Gates, I hear this story. Who does this sort of thing to a one of a kind? No, I did not find the answer I was looking for. The argument was too convoluted for me to continue looking at. In a way, true for me: I’d seen the item about The Klencke Atlas last year in the news, but I hadn’t twigged it had been re-classified as the largest atlas. The other five items of information were certainly illuminating, though I too was disappointed to hear Gates may have dismembered the Codex Leicester — as bad as those individuals who razor prints out of old books for re-sale or nighthawk metal detectorists who rip treasures out of their archaeological context. The only consolation might be if the Codex had been put together after Leonardo’s lifetime — I see from Wikipedia that it “consists of 18 sheets of paper, each folded in half and written on both sides, forming the complete 72-page document. At one time the sheets were bound together, but they are now displayed separately.” Without knowing further details it could be that Leonardo had never intended them as anything other than separate manuscripts. I’m intrigued now — must chase this up. Great post, Sari — I can’t ask more than that my little grey cells are stimulated! It was a fun afternoon research project. Now that you mention it, I do believe the Codex was compiled for a man whose last name may be Cook, but don’t quote me. I just got done writing a paper for my Global economy class so my brain is fried. This is why I have not been commenting on your blogs as much as I would like to. Economy is a new subject for me, so most of my focus has been on my class reading. This post was a way to give my grey cells a break. Glad you liked it. To make your search a bit easier, I first read of Gates cutting up the codex (after restoring it’s original name from Codex Hammer, so named by it’s previous owner, American oil magnate Armand Hammer) in Fritjov Capra’s The Science of Leonardo; Inside the Mind of the Great Genius of the Renaissance. Capra describes it as a fashionable move, saying that it was done as Leoni and other wealthy art collectors have done to other pieces. I suppose it would make it possible to display the entire manuscript, both front and back of each page, while maintaining it behind glass, but it still grates on my nerves. If you’re at all interested in da Vinci, Capra’s book is highly informative and readable, one of my favourites. Thanks for the recommendation, Martin! I’ll look out for it. Thank you Bart. Glad you liked it.